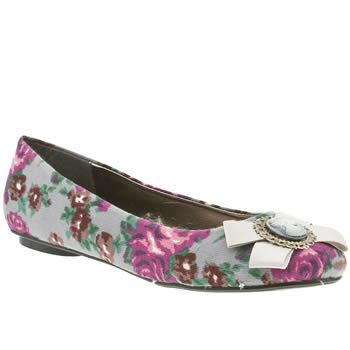 It's a flats special from Schuh's sale. Mainly because I didn't especially like any of the heels that they had on offer - there was a lot of oddly shaped heels happening, none of which were just right. Anyway, there's nowt wrong with flats is there? These are very pretty and very Spring/Summery. As far as I'm concerned, there's nothing wrong with using winter sales to add bits to your summer wardrobe. Money off is A Good Thing. These would be perfect with full circle skirts. 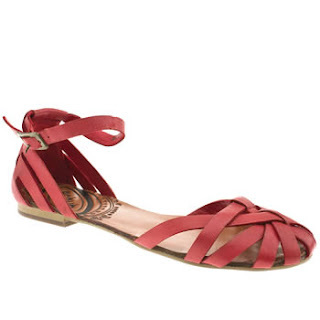 I'll be the first to admit that on first glance, there's nothing exceptional about these sandals but look at them. They'll go with everything you wear as soon as the sun comes out and the temperature goes above 18 degrees. 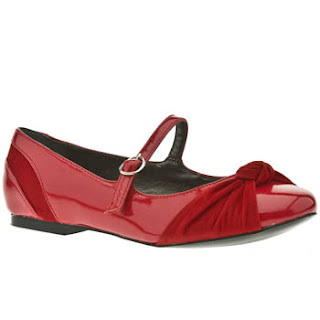 My love for red shoes is no secret and these are just too cute not to want. Shiny, velvety, lovely!